Yep, apparently it's true. 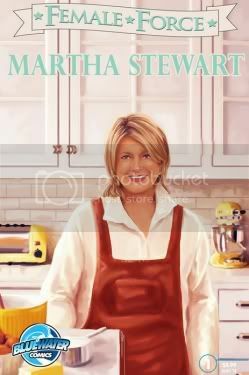 And now along with comic strip giants such as the super submarine sandwich eating Dagwood of the Blondie cartoon series, and hamburger aficionado Wimpy of the Popeye funny paper funnies, comes Martha Stewart. Yes, it seems Stewart is the latest culinary entity -- to get the comic book treatment. The domestic magnate is the subject of the latest biography in the Female Force comic series from Bluewater Productions. Each book chronicles the doings of a powerful woman, so the omnipotent Stewart isn't exactly a surprise pick. According to the release, the 32-page volume will examine the "enigma" that is Martha, specifically how she has "simultaneously and successfully projected an image of sweetness and light, while at the same time allegedly betraying some of her closest friends on her way to the top." Comic book Martha does not have a superpower, unless you count hard-core business acumen and surviving jail time unscathed. Female Force: Martha Stewart comes out in July. And I'll say it again, that with the present explosion of graphic novels being published these days by major publishing houses, is it any wonder that the foodie world is now gaining such recognition? After all, what could be more adaptable to these kinds of publications? In a word... Sweet.! Robe Lowe...As the Candy Man?